Flowers want to be pollinated and they display certain characteristics to attract specific pollinators. 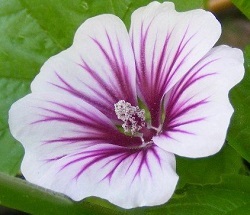 The flower’s shape accommodates the pollinator. 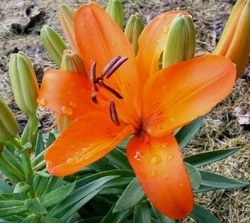 Flowers use color to attract insect pollinators. Sometimes the coloring includes special markings that guide the insect such as veining, bright throat markings, or even bright stamens. Nigh flying bats and insects may be attracted by white and pale colored flowers. The shape of the flower also guides the insect to contact the anthers and stigma, ensuring pollination. Butterflies tend to prefer red and yellow flowers. Bees of course are a very important pollinator. They are able to “see” ultraviolet light, so many flowers have ultraviolet patterns directing the bee to the flower center. Scent is used to attract insects of the night. Plants that are pollinated by bats have a strong scent. The corpse flower is pollinated by flies, so it emits a stench of rotting meat. Birds need large colorful blooms that they can see easily amid greenery. Certain flowers will even change color so the birds know exactly when to visit, and after pollinated they may change color. The nectar is usually abundant to reward the birds, and is usually deep in tubular petals to accommodate their beaks. Some flowers are pollinated by wind so they don’t need bright colors to attract a pollinator. But without specific help they need to produce an enormous amount of pollen, and aggravating hay fever. These plants can be trees, shrubs and grasses and a few flowers such as Meadow Rue. The flowers are typically dull but brushlike or sticky to grasp as much passing pollen as possible, hopefully from the same species. Blossom shapes and sizes help certain pollinators access the nectar and contact the anthers and stigmas for pollination. Some of the flower shapes are elaborately evolved to attract and receive certain pollinators’ characteristics. These shapes also aide in attracting the pollinator along with colors or scents. Hovering insects easily access most flowers, but beetles are large and not very agile and need a large sturdy landing pad. Spires of small blooms such as liatris are easily accessed by hovering insects. Bowl shaped flowers are referred to as “open access” flowers since they are easily visited by a wide variety of insects. Bowl flowers are found on shrub roses, buttercups, pontentilla and poppies. Flowers in the pea family and the sage family have closed flowers with a landing pad. The pollinator “opens” the bloom when they land of the landing pad and then easily the nectar deep inside the flower and contacts the anthers and stigma. 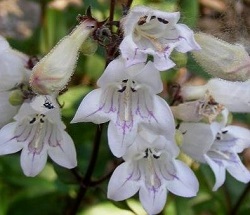 Bell shaped blooms and flowers with deep tubes are made for long tonged bumblebees. They can crawl into the tube and reach into the base for the nectar. Big chunky blooms in the daisy family have large button centers have tight little florets that are difficult for larger bees to access. Smaller bees and insects are the best pollinators. Buzz pollinations is a very specific means of collecting pollen. Certain flowers only release pollen when bumblebees vibrate their wings at just the right frequency. Only bumblebees and Anthophora bees are able to do this. Borage, tomatoes and peppers are the more commonly known plants pollinated by buzz pollination. It really is quite fascinating once you start paying attention to special characteristics of flowers and how well suited they are to specific pollinators.